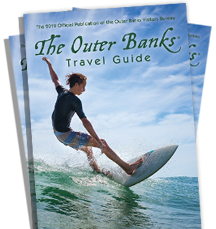 The Outer Banks of North Carolina is a different kind of place in part because of its unique ties to nature. Two ocean currents converging, dynamic barrier islands dancing with the waves of the Atlantic. Did you know half of Dare County is water? Or that around 80% of the land within the County cannot be developed because it belongs to a National or State park, preserve or wildlife refuge? Even with these assurances, we're working hard to ensure the Outer Banks remains a place dedicated to sustainable tourism and natural oceanside beauty. 475 tons of glass from local restaurants and private residences are kept out of landfills through a state of the art glass crusher. Tons and tons of oyster shells are making their way back to local waters from the dinner table thanks to an innovative recycling program. Top ranked county (out of 100) in per capita recycling rate for the last seven years. Local businesses, schools, residents and visitors participate in the voluntary recycling program.